Gud review, but i need 2 watch da movie though! Thanks a lot for reading. Movie stands out in acting department and in nuances. I agree, it’s not a movie to watch after having Porotta+Mutton !!! The presentation is very plain which matches with the protagonist’s life and attitude towards life and attachments.. There are some pointers which throws light to the way companies consider the employees – just as a resource.. like a table, chair, computer..etc.. 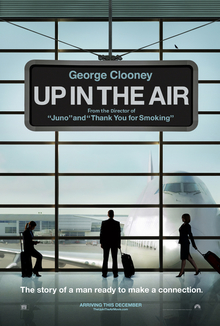 Hats off to George Clooney for the fantastic acting and the lady who played Alex’s role displayed an awesome chemistry. The director succeeded in portraying that life is not as simple as a backpack from which you can take out relations/attachments/commitments that easily. The protagonist resembles someone among us who pretend to be allergic to relations but would grab the opportunity to fall in love when he/she meets someone who they think suits best..
I’d give something close to 4, may be 3.7 !! Apologies for a a long comment.. Keep writing amigo !!! Actual people who got fired are shown in the movie. That’s what I have also read. Longest comment received so far. But loved it. Must admit that. The movie had lot of nuanced scenes. Which I did like a lot.